(Oregon Coast) - Summer means hiking to many tourists to the Oregon coast. But now with the coast's "second summer" still lingering, conditions are often drier than usual, and there is still time to wander the hills and shores at great length, in even greater peace and quiet. The coastline and its rugged landscape justifiably calls to you, with its numerous viewpoints, chances to be the only soul on a vast stretch of sand, and discoveries waiting to be unearthed. They come in all sorts of shapes and sizes. From the easy walks of minor trails like the one behind Cape Perpetua, to more grandiose undertakings like the eight or so mile-long loop around Tillamook Bay’s Bayocean Spit or the six miles of leg cramp-inducing trudging from Seaside to Cannon Beach over Tillamook Head. Here are just a few of the possibilities for the rugged outdoorsman – or woman. 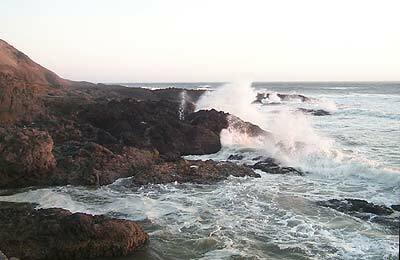 Just south of Yachats, on the south side of the Devil’s Churn and Cape Perpetua, there is an easy but especially magnificent hike, which takes you to a dreamy little semi-secret beach. 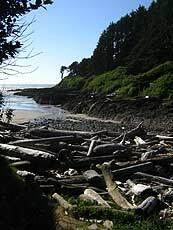 Perhaps 100 feet north of Cook’s Chasm, the trailhead sits, next to clifftop views of the southern side of the headland and a labyrinth of rocky slabs dotting the wet sands which provide a few hundred feet of beach called Cape Cove Beach. A partially paved path winds its way down here, perhaps a few hundred feet down a steady but not too steep incline. It takes you through dense brush which allows only small and intermediate views of the wonders below. You get to a landing in the dirt, with a sign pointing the way you just came or to further along the base of Cape Perpetua. You emerge onto Cape Cove Beach and a veritable apocalyptic mass of enormous logs, obviously slung here by the incredible power of the waves. This spot doesn’t fool around during stormier times of the year, and it’s likely not accessible at all in much of the harder seasons. The frightening supremacy of the sea is clear here. 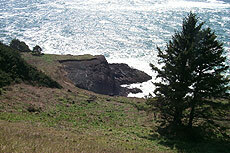 This little cove runs a ways into the cliffs, ending at a stream that pours from the earth, where the trail emerges. Rocky slabs are all over this beach, many of which are usually beneath the tide line. Strange geologic features dot this place everywhere. Then, if you don’t know what to look for, you’ll miss it: the top of Cape Perpetua looks down on you from this beach from its 803 foot perch. If you’ve ever been to the top, then you may recognize the odd wave-like cuts in the soil near the tip, which are more clearly visible while up there. 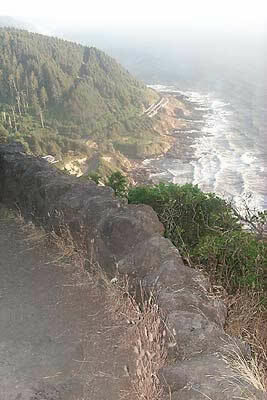 For more trail action, you can walk down to Cook’s Chasm, take the small trail to the interpretive center, then embark on a harsher journey up the hill some 1.5 miles to the top of Cape Perpetua. Along one of these trails, you’ll also find a shelter made of stone, which was built during World War II as a lookout for enemies that never arrived. A short trail from the main overlook’s parking lot leads to the shelter. It rises about 1,100 feet at one point. 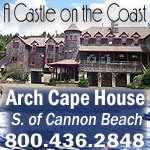 It's where part of Lewis & Clark's troupe walked to what is now Cannon Beach to check out a beached whale. 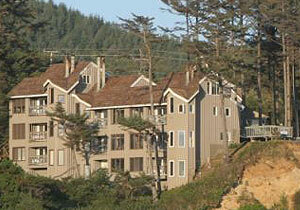 And it offers stunning views of the ocean, rock islands and the mysterious Tillamook Head Lighthouse a mile offshore. But mostly, Tillamook Head has hiking trails throughout it, which are accessible from both the Seaside and the Cannon Beach sides, although it's a 6-mile hike over the entire headland. This is highly recommended for exploration with numerous breathtaking views to be found on this cliff structure, and in such places there are always hidden spots in the brush and forest. Indeed, there are the remnants of an old army bunker in the brush at some point along this magnificent trail. Lucky for you, there are easier ways to enjoy it than the full trip. Starting at the Cannon Beach side, begin your jaunt at Ecola Point in Ecola State Park and hike 1.5 miles to the parking lot at Indian Beach. Continue on another 1.5 miles from there and you'll get to Tillamook Head's point and see the bunker, find a primitive camping spot for hikers as well as enjoy breathtaking views of a rugged beach and the lighthouse. Round the bend of the point, and it's another four miles to the Seaside trailhead, past more incredible views, including the summit and a point Merewether Lewis wrote about. 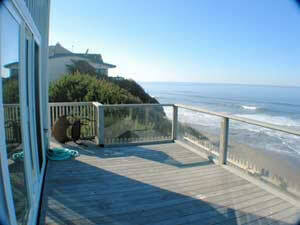 If you take the Seaside trailhead, that side has a much steeper incline. If you're driving just south of Depoe Bay, you may notice a tiny, nondescript road called Otter Crest Road - one that may not peak your interest. As it meanders below 101, it dead-ends less than a mile down, at a spot just before where a big landslide tore the road away a few years ago. It's never been the same since - thankfully - as officials have turned it into a pleasant, canopied and one way road with a bike/foot path along side, all above beautiful, rather secretive cliffs. This quarter-mile walkway ends up at Cape Foulweather, where you can also park to make this small but mesmerizing journey. It's a very easy walk - and an especially tranquil one, except for the occasional unnerving presense of cars eeking past you. For something more adventurous, wander down to the cliffs just below the paved trail and take in some unbelievable views. The best way to get to these is at the north end of where the road becomes a one way. Park here, hop the fence and you'll find a steep trail meandering as you abruptly enter a dark forest area (which sometimes boasts really huge, wildly-colored mushrooms). The scenery explodes in front of you with a sense of the spectacular and the grandiose as you step out of the forest to a big ocean vista. This area is an amazing labyrinth of rocky cliffs, pointy things and smooth things, and parts of these basalt slabs actually form flat seats overlooking some incredibly dramatic wave action. A trail running along side of the hill lets you access a second cliff just south of it. Wander along streams, through a thick Douglas Fir forest and stand awe-struck at the incredible views at the summit. Gaze in wonder at the ancient Sitka Spruces still left after logging of the area and maybe catch sight of a salamander, deer or even a bear amidst the huckleberry and swordferns. Two trailheads let you onto the trail. The lower trailhead starts some 2 miles down a twisty gravel road. 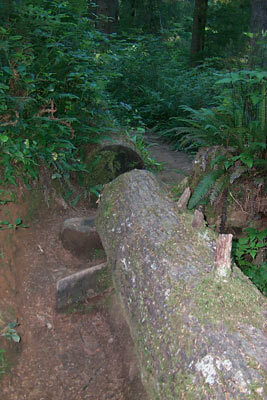 There is a barricade and parking lot at the end, where the trail begins a six-mile ascent through lush forest. Look for MP 168 and turn east. It's almost kitty-corner from the entrance to Neptune State Park. At the top is another parking lot, which you can reach by a forest service road. That road begins some two miles south of the road leading to the lower trailhead. 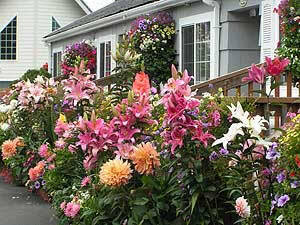 It is almost kitty-corner to the Strawberry Hill entrance, and takes you some ten miles up steep and winding roads. Experts advise taking this route and arranging a car waiting for you at the lower trailhead because it's much easier to descend. This majestic headland is packed full of incredible views, a wondrous forest overhead and numerous surprises - plus there are three trails to enjoy. The aircraft was based out of Pendleton, Oregon and was on maneuvers when, due to fog, it crashed into Cape Lookout and cut a swath through the headland 50 ft. wide and 500 ft. long. All but one of the 11-man crew were killed in the crash. He was found two days later and eventually recovered. The plane pretty much disintegrated upon impact, and all its pieces have either been eaten by the forest or been taken by souvenir hunters in the last 55-plus years. Keep in mind, except at the absolute driest times of the year, these paths often contain spots which are extremely muddy and damp. After all, they essentially plod through a rain forest. There's also quite a bit of wind up here on top of this lofty headland, even on a day where it seems like there's little wind on the beaches. So be advised of the weather and wind conditions before you go.